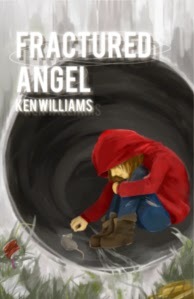 Today we are interviewing Ken Williams, author of the urban poverty novel Fractured Angel. After working as a social worker for the homeless in Santa Barbara, California I have decided to move on and write full time. While working the streets of this beachside community I worked primarily with the long-term disabled. And within this group my specialty was the mentally ill homeless. But I also worked with the physically disabled, those impacted by alcohol and drugs and those who ended up on the streets due to the human condition. Obviously this included a lot of veterans. Perhaps most disheartening were the homeless children and women. Women had to not only deal with the issues that men had to but also with the widespread violence against them on the streets. It was like they carried a sign that told the world of their vulnerability once the security of housing was ripped away from them. I have lost count how many of my clients’ lives ended violently and/or tragically short. A memorial wall that a friend of mine commissioned to honor the homeless who have died in Santa Barbara has the names of over three hundred people! These names came from my journals that I kept that document my work. The youngest name on the wall belongs to a four-month old baby. Can you imagine a baby dying on the streets in one of the wealthiest city’s in the world? Few people witness such carnage during their careers. In your new novel, Fractured Angel, you write about a struggling teenager and the people trying to save her. What made you decide to specifically write about a teenager on the streets? Again, homeless women and homeless children were the most heart wrenching to deal with. Adding mental illness on top of homelessness and their particular vulnerability you have a Kafkaesque landscape of pain. So many times I would find a young homeless woman, a child really driven to the streets because of her first psychotic break. Not only are they trying to deal with the alien world of the homeless but with the unknowns of a wounded mind. I remember this one time this successful businessman came to see me. He was dressed in an expensive business suit minus the tie which he had ditched seeing the foreign environment that he was forced to enter in the search for his daughter. He had come to Santa Barbara looking for her. She had sent him a postcard from there, scribbling some nonsense on it. The cops and homeless shelters told him if anyone could find his daughter it was I. He gave me a picture of her. It was torn in half to exclude other family members. It was the last time the family had been together. I remember standing in the hallway when he gave me the picture and his business card, (a Silicon Valley tech firm) and thinking how totally different we were from each other. Me from the public sector whose job took me daily to the streets and him a highflying businessman in the promising new field of technology. Yet one thing did we have in common: The love of our children. And the heartbreak that I saw in this man still haunts me to this day. Fractured Angel is a very personal novel for me. I can still see the faces of so many mentally ill homeless women who were beaten, raped and killed. And yet life went on in the city as if this was nothing out of the ordinary, nothing to get too concerned about since they were neither famous nor rich. 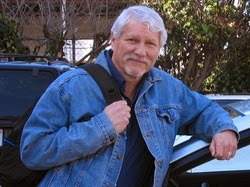 Ken Williams, author of "Fractured Angel." Describe your process of moving from an idea to a finished book. I find the creative processes of the mind to be fascinating and somewhat mysterious. As you can see I live with a lot of memories and I have my journals. I begin to think of situations I have lived and how can I fictionalize them and bring them into the construct of a novel. Free flow writing doesn’t cut it. You must know the art and rules of writing a novel. For me the first step of writing a novel is coming to know—to really know the creative core, the arch, or arches of the story one is trying to tell and the characters that populate it. I find dialogue; realistic dialogue is the key to what gives characters their uniqueness, their strengths, flaws, demons and angels. When I have an idea what it is I’m trying to tell I then will write pages of notes of scenes, characters and situations. I don’t use an outline. Once you start writing I find that the characters take on a life of their own, act and react to situations in their unique way. To try and stuff a story into an outline robs it of its natural flow. When you write a novel you are crating an artificial universe, yet that universe is governed, as is our own by laws and forces. Of course several rewrites follows. There is a lot to remember in a novel and internal logic of the story must be strictly adhered to. You have more than thirty years’ experience working with the homeless population. What got you interested in working with the homeless? While recovering on a hospital ship during the Vietnam War I came across the novel: I Never Promised You A Rose Garden. It dealt with a young girl suffering her first psychiatric break. Realizing that I might just survive the war I promised myself that if I did so I would dedicate my life to work with the mentally ill and outcasts. I think it was a way to try and come to some kind of moral terms with all the violence and pain one sees in war. I know that if I had come home and not tried and work to make amends for the carnage of war I would have ended up in a very different and sorrier place than I am in now. You served as a Marine in Vietnam. How has your experience as a veteran allowed you to help other veterans? Homeless veterans don’t trust most people. Trust was the cruelest casualty in Vietnam as I’m sure it is for Iraqi and Afghanistan veterans as well. We came home bitterly disillusioned knowing that our trust in our government and its institutions had been used to propagate an unjust war. We felt a huge sense of betrayal. Also the country wanted to pretend the whole war never happened. Veterans were a constant reminder of what they wanted to forget. So most of us kept the war to ourselves. Almost all of my college friends, and my work comrades as well never knew I served. Again, it was something we kept to ourselves. But then ironically, and suddenly all sorts of men who hadn’t served claimed to be combat vets. It was the Rambo effect. A macho, make believe for men who wished they had served in a fairy tale war. It got so bad that when someone I was working with on the streets claimed to be a veteran I assumed he wasn’t. But war veterans have a way of knowing each other. The skepticism of the government and the war of the moment is one clue. Other subtle signs distinguish a war veteran from those who have never heard a gun fired in anger. The word quietly and quickly spread that I was a veteran and in time homeless veterans began to search me out and ask me for help securing benefits, placements in shelters, help with the V.A. etc. You have to love the irony. Within a handful of years our country went from shunning veterans, and veterans hiding their service to one where every wannabe He Man claiming to have served. And of course all the wannabes claimed to have served in Special Forces, no grunts at all. How does writing fit into your role as someone who helps the homeless? In fact helping the homeless directly caused me to pick up the pen—or should I say keyboard. First I began to write quick snippets in my journals. I began to do that when, during the Crack and AIDS epidemics when I was losing so many clients, and so fast were they dying that I was beginning to forget them as individuals. Then I began to write letters to the editors of the local newspapers about the treatment of the homeless and the hateful prejudices many of them were being subjected to. The newspapers began to run my writings as features. Then noozhawk.com put me on as a columnist for their online news service. A screenwriter, having heard me give a speech about the homeless encouraged me to write screenplays. From writing screenplays it was a logical jump to writing novels. Looking back it seems like a straight line, cause and effect so readily apparent. But I can assure you at each milestone it was anything but, the only constant being one of engagement: The need to help my clients. To do so I had to humanize their existence and their tribulations, to demystify the stereotypes that society had fenced them in with. The same journey was traveled with my writings about war and its impact on veterans. Agent Orange, PTSD, the forever war against terrorism with constantly changing sides, all these I also addressed in my writings from letters to the editors, guest columns, feature articles, screenplays and novels. What are some lessons you’ve learned from 30+ years of working with the homeless? Working with the homeless is a humbling experience. Every time you think you know something the reality of the streets teaches you otherwise. Every prejudice I had was challenged. Every prejudice was revealed as ignorance on my part. Also the homeless taught me true spirituality. Not in the formal sense of organized religion but in the real sense of seeing a greater whole than merely oneself and how we are all interconnected. I think part of the spirituality that I saw in the homeless comes from them being a survivor of an unjust system. Most of the homeless that I knew lost their homes, thus their connection to mainstream society by forces outside of their control. Then they had to endure the violence and the prejudicial hatred that the homeless are subjected to. In many ways their quiet life with a spiritual grace in the face of an unjust fate was what I saw on the hospital ship, especially with the mutilated civilians who were horribly burned by napalm. The universe is a vast and indifferent place. The earth can often be an unjust and cruel home planet. Yet some of the kindest and most caring people I have known are those without anything—even something as fundamental as a roof over their heads. I stand humbled over what they have given me in knowledge and spiritual teachings. …Sitting in almost total darkness, trepidation drew aged lines across her face. Staring hard at the rat, she watched him pawing at the dirt. Was he about to charge her like a raging bull? She looked around hoping to see her companions; that is—the ones who existed independent of her mind. But, like so often recently, aloneness stared back. Cold hollowness froze her insides as if carved out by a scalpel. A hard shiver rolled over her. Fear registered in degrees. Tensing her muscles, she prepared for flight. Paused. She convinced herself that it was just an ungrounded fear. She pretended that the other wasn’t present. And, the rat was no threat. He hadn’t done anything to hurt her. He hadn’t even really threatened her. As was often the case, the frightening situation was made harmless once she was able to acknowledge fear and meet it head on. She smiled. Maybe the rat could be a friend? She could use a friend. She stared. It was curious—no, lonely—like she! Tracy’s paranoia dissipated. The insight that this fellow creature shared sadness with her opened her heart. Looking about, she found a chunk of stale bread from last night’s dinner. Slowly, she reached out her hand, holding the bread before the rat. An offering. The rat perked up with interest. With no fear, it quickly paced the few steps that separated him from breakfast. It sniffed the bread and began to nibble. A crooked smile came upon Tracy when his long whiskers tickled her hand. Suddenly the rat chomped down hard, yanking the bread free. She squealed with delight. Her eyes brightened honoring the courage of the rat. If only she had such inner strength! Tracy once again looped her arms through her legs and began rocking back and forth to the beat of a cadence heard only by her. Humming a gentle children’s lullaby, her soft voice filled the lonely void. Abruptly, she stopped. The sudden silence was first oppressive, and then terrifying. An ache swelled within her body and soul, rising like high tide before a storm. She shut her eyes. Tears broke from them. She swallowed the liquefied salt hard. A new insight: Fear also had a taste. She missed her mom. Maybe she would know what to do about the voices. Her lips pinched hard. Her mom wasn’t there. She was alone. Her only companion was a rat. It was possible that even her roommates only existed in her head. Maybe, the only reality was Him—the danger that lurked in the darkness. Her body locked up as she forced herself not to look about. Maybe he was simply waiting for the fire to die out before he jumped from the blackness to devour her. Tracy rocked harder and began humming again. She ratcheted up the volume—increased the intensity. No longer was it a lullaby. It was the only trick she had left. And it did help with the voices. The dying light flickered—its will to live fleeing. Her own—was not too far behind.